AURORA, Colo. -- An Aurora, Colorado man’s family is asking why no helped him when he suffered a fatal medical emergency on board a bus. 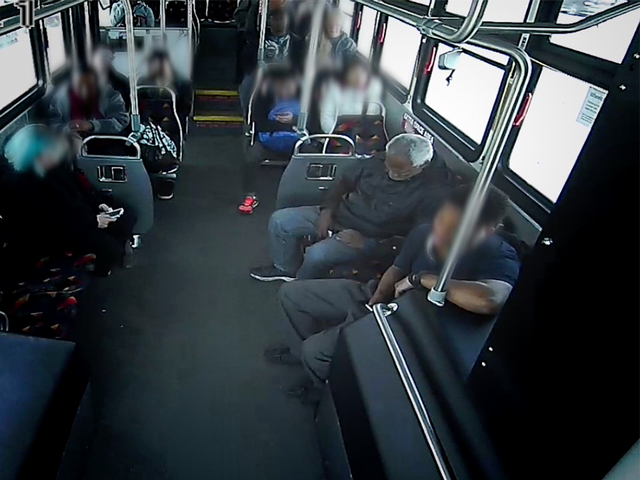 Video from the April incident shows Bruce Hocker, 63, suffering the medical episode within a minute of boarding the bus in Stapleton, Colorado. The video shows Hocker breathing heavily, gasping, then slumping over. Hocker remained slumped over without anyone appearing to notice for 19 minutes until the bus reached the end of its route. At that point, the bus driver tried to rouse him, then sought emergency help when he would not wake up. The video shows paramedics boarding the bus about 10 minutes after the driver called for help – 31 minutes after Hocker’s medical emergency began. The paramedics found him without a pulse. “It was devastating to see how he passed away. To pass away helpless, alone, with no one to help you… that's terrible,” Hocker’s nephew, Kenneth Dixon, told Denver-based KMGH Investigates. Dixon reached out to KMGH after viewing the video and realizing the bus driver never spotted his uncle in her mirror or stopped to help him, and none of the ten passengers who rode on the bus with him checked on him or notified the driver. Hocker’s autopsy showed he died of cardiac arrest. Hocker’s sister, Larkquanetta Dixon, says she often thinks about the last time she talked to her brother, just a few days before he died. Hocker’s family told Denver7 Investigates they came forward because they want his death to create change to RTD’s policies. Agency officials tell Denver7 Investigates bus drivers are required to stay in their seats behind the wheel throughout their routes. The driver involved in this incident was not disciplined and RTD officials say she followed every policy. RTD officials said it is not uncommon for passengers to sleep on the bus and passengers may have assumed that’s what Hocker was doing. The video shows the man seated next to Hocker moved to another seat when he slumped over. Hocker’s family wants both passengers and drivers to keep an open mind and check on someone if they need help in the future. “Why assume that just because a person gets on your bus that that person is homeless, a drunk or a substance abuser? Why assume that person doesn't need any help?” Dixon said. “As an RTD board member, will you ask RTD to look closer at what happened here and consider a policy change?” Denver7 chief investigative reporter Tony Kovaleski asked Tobiassen. “Our operations staff is looking at this situation, as we do with every situation, and what we can do better,” Tobiassen responded.